A resemblance to the taste of the legendary American cake "mud cake"
Feel Free Nutrition Muscle Mud Cake is a gluten-free, high-protein cake for the preparation in a microwave oven. It was designed following the formula of the legendary, extremely popular and beloved mud cake. It has a chocolate-caramel flavor, it is soft, moist, and delicious. The functional foods market is dominated by protein bars. Meanwhile, people who watch their line, or who are fighting for a slim figure, when asked what they lack most in their diet, most often reply that it is a piece of cake. To meet their expectations, Feel Free Nutrition created a cake that reproduces the consistency, taste, and aroma of the iconic "mud cake". This cake tastes like real, homemade baking. In contrast to sticky, rubbery, and clogging protein bars, Mud Cake is fluffy, soft, and moist. It is filled with chocolate chips, which simply melt in the mouth. The presented cake will work well in the role of a dessert, as well as a healthy and nutritious meal. It consists of gluten-free oats, that is, complex carbohydrates, which are characterized by a low glycemic index and are an extremely good source of energy, ensuring the feeling of satiety for a long time. In addition, each serving provides up to 20g of protein derived from whey protein concentrate. It is known mainly to athletes – it contains valuable amino acids, promotes the growth of muscle mass and improves post-workout regeneration. It is worth mentioning that the whey protein concentrate is rich in unique bioactive compounds with scientifically proven pro-health properties. The product is also composed of medium chain triglycerides (MCT). It is hard to find a better source of fats. Medium-chain fatty acids are easy to digest and may a thermogenic effect. The body also uses them as a source of energy. For this reason, MCT oil is especially recommended for physically active people or those who are on diet. This delicious, nutritious, chocolate cake can be prepared in less than a minute! What's more, you do not need to have any dishes, and no culinary skills are required. This information will be especially appreciated by people who are busy or those who do not feel comfortable in the kitchen. Just add water to the cup contents and put it in the microwave. After a while, take out the ready-to-eat, yet warm, chocolate cake. This "mud cake" is ideally suited to the role of a dessert, but it can also replace a peri-workout meal. 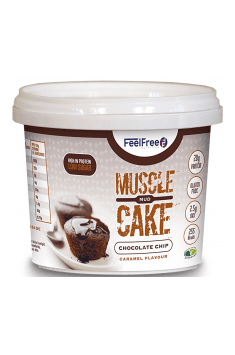 In conclusion, Feel Free Nutrition Muscle Mud Cake is a "cupcake" in a healthier and more nutritious version. It tastes like home-baked goods, but it has definitely fewer calories, it's free of sugar and gluten. It allows to easily increase the supply of proteins. It is ideally suited to athletes and people who care about health and their line. Add 50ml of water to the cup and heat it up in the microwave for 40 seconds. The product contains gluten-free oatmeal, which is why it is suitable even for people with hypersensitivity to gluten. The cake owes its sweetness to sweeteners, so it is worth remembering that a one-off intake of excessive amounts may cause a laxative effect. This product can be recommended to physically active people – it works well both before and after an intense exercise. People who do not train can boldly use it to replace desserts such as cake, cupcakes or muffins. Gluten Free Oats, Whey Protein Concentrate Powder (from Milk), Dark Chocolate Chips (19%) [Sweetener: Isomalt, Palm Oil, Fat-Reduced Cocoa Powder, Emulsifiers: Soya Lecithin, Polyricinoleate], Buttermilk Powder (from Milk), Milk Protein Concentrate, Maltodextrin, Medium Chain Triglyceride Powder, Egg White Powder, Raising Agent: Sodium Bicarbonate, Natural Flavouring Substances, Thickener: Gum Acacia, Acid: Citric Acid, Sweetener: Sucralose. *For allergens see ingredients in bold.